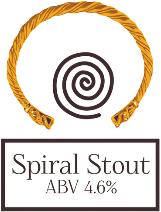 Spiral Stout is a traditional stout. The name comes from the spiral motif which is one of the most common symbols in Celtic culture. The beer itself has an aroma of dark autumnal berries, and is full bodied with flavours of the berries and undertones of coffee and dark chocolate. It has a gentle lingering dry roast finish with a hint of smoke. It received the Silver award in the Stouts and Porters category at the Norwich Beer Festival in 2015. Vegan beer.